Discover what the average tuition charge is for U.S. students throughout the country, and how Boricua College compares. Learn how the tuition and fees at Boricua College match up to other U.S. colleges and universities and learn how you can properly get ready for potential college tuition increases. The subsequent table outlines how Boricua College measures up to other schools nationally, regionally and by state. In the 2017 - 2018 academic year, regular students at Boricua College were billed $11,025, before modifications for financial need. From this total, the expense of tuition was $11,000. The other $25 represents additional fees. Unfortunately, this school does not offer any special discounts to in-state students. Fees and tuition charges quoted on this page do not include room and board, which will increase your costs. However, most students wind up spending below full tuition after getting financial aid along with other rate reductions. Boricua College tuition and fees have stayed stable in the last five years. We estimate the expense of tuition and fees for this year will total $11,025. If prices continue to remain stable, two years here will run you $22,050 and four years will run you $44,100. In addition, you will probably have additional costs such as room and board, transportation, and books. 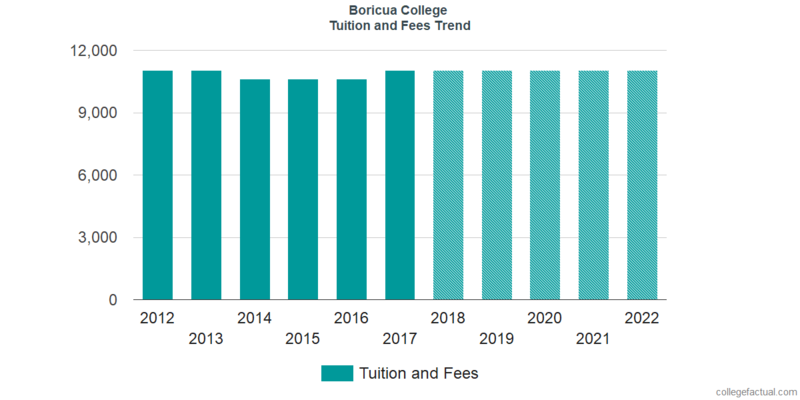 The next chart displays projected upcoming tuition and fees for undergraduates at Boricua College. Because of inflation along with other variables, the price of college is likely to increase every year. For this reason your final year of college could be much more than your first year. Discover our answers to frequently asked questions and additional information about college tuition and fees.